No stranger in the crowd could doubt ’twas Casey at the bat.” Part of the poem by Ernest Thayer published in 1888. 5. 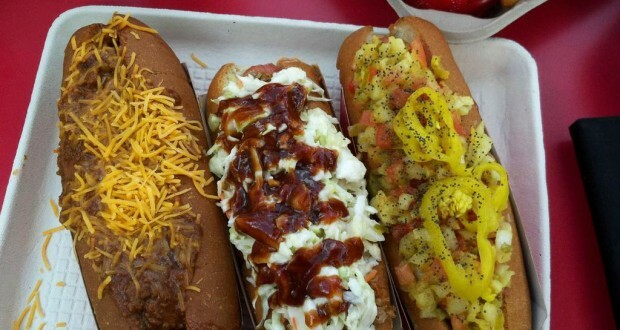 Casey at the Bat inspired this corner of hot dog heaven. This is a baseball themed eatery in the Magic Kingdom and the menu is sure to please baseball fans with a wide choice of hot dogs such as the Sauerkraut Dog, Chili Cheese Dog, Barbecue Slaw Dog, Corn Dog Nuggets, Polish Sausages and other standard fare such as French Fries, Cotton Candy and of course Cracker Jacks! If you enter the park and start working your way down Main Street inside the Emporium, you will begin to smell the wonderful food at Casey’s and by the time you find it you will want a hot dog! 4. There is a Piano Player named Jim that tickles the ivories every day playing ragtime hits, you name it this guy can play it. He is outside under a cover playing the white upright piano. He performs for twenty minutes at a time. Try to catch his show while you are enjoying a meal or snack at Casey’s. 3. Casey’s is at a Great location at the corner of Main Street U.S.A. it has a great view of Cinderella Castle, and Wishes. You may have a tough time seeing a parade if you are eating on the patio by Casey’s Corner just because of the large number of people who will stand on the sidewalk blocking your view. If you come into the park hungry, Casey’s is the first counter service restaurant you will come to. As you smell those delicious hotdogs you will know you have to have one. 2. Enjoy the décor of this turn of the century eatery. Although some major changes occurred in 2014 during a renovation, it still has a strong baseball tone sporting Mudville pennants, baseballs and baseball bats on display, baseball hats, a large scoreboard still hangs on the wall, but the old bleacher seats and TV screen have been removed to make way for better seating inside. There are turn of the century baseball posters and photos on the walls. The mood is that of pre-game excitement with a large sign that says “Ball Game Today” over the doorway. Coca Cola is the sponsor, which you will surely notice by the memorabilia and the Cast Members are dressed as baseball umpires. 1. The statue of “Casey” out front greets diners, just as he has for 40-some years now. Before you say, “hey Casey was at the bat, like the poem says, so why is he standing there with his glove and not a bat?”, but remember he was also a player in the field. Watching more than a few pro baseball games, I notice that some players never put their glove down in the dugout. Or sometimes when they see an inning about to end they will pull on their gloves, ready to go out in the field to play. In the poem the two players preceding Casey were expected to strike out, but they didn’t. They were on second and third. On that day in Mudville the home team had their hopes on the mighty Casey if he could just get to bat, he would win the game. They were certain. But he struck out. Undoubtedly he would have gone back to the dugout and picked up his glove. Whatever he is looking at his stare in pretty intense. Maybe he saw a guest that looked like the umpire that day that called three strikes on him?